Lucknow, March 20: Congress General Secretary Priyanka Gandhi's three-day "Ganga Yatra" in Uttar Pradesh came under severe criticism by Samajwadi Party (SP) leader Ram Gopal Yadav. The leader, who is also Akhilesh Yadav's uncle and considered close to him, took a potshot at Priyanka's visits to temples saying that "only those who are in trouble go to temple and the Congress is in trouble in Uttar Pradesh." Priyanka Gandhi Vadra Drops Holi 2019 Celebration Plan, to Meet Kin of Pulwama Martyrs. Priyanka Gandhi Vadra, who visited the Vindhyavasini temple in Mirzapur on Tuesday, and performed Ganga Aarti on Wednesday, began her three day political campaigning from Prayagraj on Monday. Priyanka Gandhi Holds Roadshow in Mirzapur On Day 2 Of Ganga Yatra Ahead of 2019 Lok Sabha Elections, See Pics. 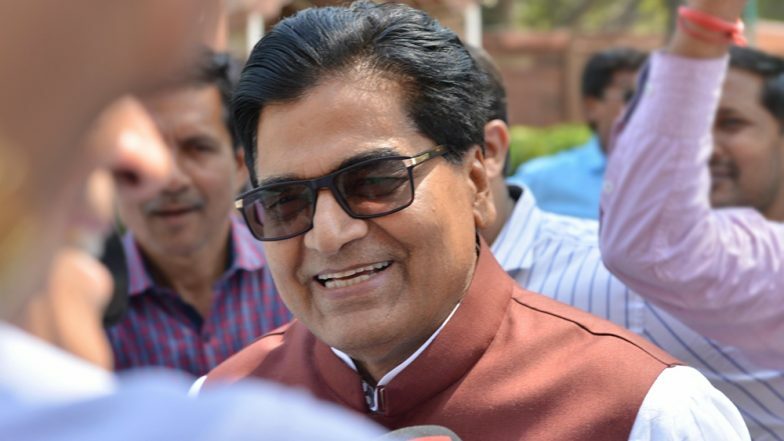 Ram Gopal Yadav's comment comes a couple of days after Akhilesh Yadav and Mayawati tweeted saying that the Congress should not create any kind of confusion after the grand old party said that it was not naming any candidate from seven seats. "The Congress should not create confusion by forcibly trying to leave seven seats for the gathbandhan," said Mayawati in her tweet, backed by Akhilesh Yadav.